Here's my own 3000 point list, I'm curious to see how it would actually do in a standard tournament scenario. @tc63 Wow loving this list, so many characters! One option Could be that you allow buying of buildings / terrain like Dkok / BSM. maybe not a whole precinct house (as I'm sure they would leave its immediate area sometimes) but maybe the option to buy road blocks / checkpoints... etc. This would allow them to delay Tanks as this list is fairly light on the AT front, and it works with the thematic aspect. - Why do the Arbites have access to a non-STD Chimera variant, with limited availability, when the Imperial Guard don't? Ah yeah, I like the idea of the buildings / terrain, could maybe somehow tie it in to the tarantula formation, or create a terrain piece that replaces one of the objectives. I'll have a think about how to pull it off. I'm going to have a look at how to increase the cost of some formations to maybe reduce the activation count. While it could be used to force the theme more (being able to 'waste' activations to get the enemy to commit forwards is quite defence orientated I suppose) I would rather it weren't so easy to get 12+ activations. I could instead limit the support formations to one per core formation. I'd considered an armoured vehicle type after Apocolocyntosis' comments about a pacification vehicle. I quite like the fact that they are so limited at the moment though, having nothing mobile with more than 30cm range and a distinct lack of AT should force some quite interesting play. Again, I'll have a think, but I'd like them to have to break units to do any serious damage to them. I'd looked at a way to include Mike McVey's classic Arbites RCV (http://i189.photobucket.com/albums/z121 ... he/RCV.jpg) as a variant transport, but actually a rhino is probably the closest equivalent anyway. These are crying out for that role - something between a rhino and a chimera in firepower, maybe 6+ AP/disrupt weapons? 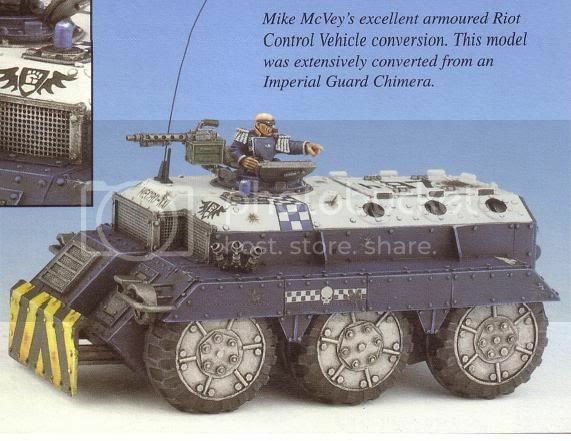 Personally I'd rather see the use of the wheeled variants of the chimera as they seem more SWAT than the 4th ID. Not sure if that's simply a cosmetic change but perhaps it gains road speed bonus but slower offroad? [shrugs] Regardless I have a bunch of 6m El Diablo for them anyways. In terms of mobile AA, I could add the transport upgrade to the tarantulas (2 tarantulas per rhino/repressor). It would add some fragile mobility for the only AA and AT weapons. The tarantulas could also maybe be added as an upgrade to the patrol formations? I think they suit the Arbites theme quite well, but the immobile-unless-transported aspect would prevent them becoming an overly reliable source of AA/AT. Another update to this list. Please see original post for PDF. I've been thinking about adding a further special rule to enhance the 'flavour' of the list and further differentiate them from other Imperial army lists. At the moment the standard patrol formation seems poor value compared to the steel legion's stormtrooper one. I know that things cannot be looked at in a vacuum, but for the same price you get 8 stormtroopers compared to 6 arbites, yet they have almost identical stats. -must have 4+ arbite patrols or suppression teams in base contact, but need to find a way effectively describe that there must be 4+ units in a continuous line/contact with each other, not for instance 2 pairs of 2 units in base contact only with each other. Maybe adding a 'shield wall' rule to patrol and suppression teams to further clarify it is only these units that qualify. -must still have 4+ of these units in contact after casualties have been removed. I'm thinking this may make an arbites player think a bit more tactically when forming up for assaults rather than just throwing things towards the enemy, much like actual riot tactics rely on strong formations to be effective. I could then justify making the patrol formation cost around 225 points and bump the cost of other infantry formations, reducing the potential activation count. Does this seem reasonable, and if so does anyone have a better functioning brain than I in order to write a brief and clear summary of these rules to place on the army list? Whatever I write seems to take up about half a page. Close Order Drill: Arbite formations that include a character with the Close Order Drill rule of at least 4 or more arbite patrols or suppression squads, which are in base to base contact with another arbite patrol or suppression squad base, at the end of an assault add +1 to the combat resolution. The whole unit needs to be in one continuous chain E.G. 4 units in a ‘Triangle’ arrangement would benefit, however one set of 2 and then another set of 2 wouldn’t. About the cyberdogs, what do you think about "expendable"? They not worth 50p for 2 units now, even with infiltrator i think. btw, what do you use for cyber k9s? You're probably right, 50 points is most likely a bit steep, I just wanted to keep them in twos (for transport purposes). Looking at the kroot hounds, they are 50 points for three and come with 3+ CC rather than 4+, but have no armour compared to 6+ on the cyber mastiffs. I could add the expendable rule and/or add either a further point of armour or CC to them to make them quite a bit more worthy of the cost. Would this be about right do you think? Yes, it sounds good -either way, maybe after some playtesting it will be easier to decide which one is more balanced. About AA minis i use exodus wars precint, but no cyber k9 there..